went up to Summit Ridge grove, a patch of ancient forest. In the ridge patch of old forest saw good specimens of the two grand trees Metrosideros robusta [Northern Rata] and Metrosideros tomentosa [Metrosideros excelsa, Pohutukawa]. (see Jan. 1 for description) January 18. 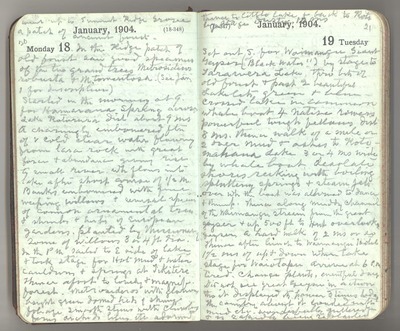 Started in the morning at 9:00 for Hamarana [Hamurana] Spring across Lake Rotorua did about 9 miles to an old mission station [From Muir’s journal, 10 January]. A charming embowered fountain of very cold clear water flowing from lava rock with great force and abundance, giving rise to a small river which flows into lake after short course of half a mile. Banks embowered with fine weeping willows and several species of common ornamental trees and shrubs and herbs of European gardens, planted by missionaries. Some of the willows three or four feet in diameter. In the afternoon sailed to east side of Lake Rotorua and took a stage for hot mud and water cauldrons and springs at Tikitere. Thence afoot to lovely and magnificent forest. Metrosideros with glorious bright domed heads of shining foliage, smooth stems with climbing ferns, orchids, lilies etc adorned. Thence to a little lake and back to Rotorua by stage - dusty - 10 miles. January 19. Set out south for Waimangu giant geyser (‘black water’) by stage to Tarawera Lake, through bits of old forest and past two beautiful lakelets, Green and Blue. Crossed Lake in common whale boat - four native rowers, powerful tough fellows - distance eight miles. Then a walk of a mile or two over mud and ashes to Rotomahana Lake, three or four miles wide by whale boat. Desolate shores reeking with boiling and spluttering springs and steam jets, over which the boat was allowed to dance and thump. Thence along muddy channel of the Waimangu stream from the giant geyser and up 500 feet to hut overlooking the geyser; hard walk of two miles or so. Thence after lunch to Waimangu hotel, one and a half miles of up and down, where take stage to Waiotapu. Arrive at 6:00pm. Tired. Change plants, eventful day. Did not see the great geyser in action, though it displayed its power three times today. The country about it loaded with mud, etc., wonderfully guttered and is rapidly being replanted.